We are often overly concerned about our weaknesses and get disappointed with ourselves because we fail to see that this world is a world of duality. Every object or experience is like coins with two sides. Everything that is seemingly good has a negative aspect and everything that is seemingly bad, has a positive side. Let us first look at our strengths. I have a friend who is very good negotiator. We will call him Chan. No one can get a better price than him. When his company was setting up a branch overseas, he was tasked with the job of negotiating the price for the renovation works at the new office. He managed to negotiate a price that was so low that everyone acknowledged that no one else could do a better job. Everyone celebrated. When the job was completed, Chan visited the office and was shocked by the shoddy paint job. When he questioned the contractor, they explained that the contract sum was so low that they could only paint a single coat on the wall. In addition, some jobs were not done and Chan could not hold them to it because they were not clearly mentioned in the quotation provided by them. They were willing to forgo the retention sum on the contract and refused to follow up on the job. Chan had no choice but to finally agree on a variation order and increase the contract sum. Another person who is apparently weak in negotiations may have gotten the job done faster and at a lower price. I have observed that the law of the universe ensures that an honest person always meet with honest folks. A person who always tries to get one up on others will often meet with those who will do the same thing to him. It appears that our personality radiates some form of energy that attracts like energy to us. So, a person who is not a great negotiator may be able to establish long term relationships with many suppliers that benefits his company in the long run. I have often heard that in this dog eat dog world, it is difficult to be honest. A salesman will say that sometimes they have to lie to close a sale. Being honest and straight-forward then becomes a weakness. The honest person will then feel bad about his personality instead of seeing it as a virtue which he can be proud off. But if we look deeper, we will see that an honest person will, over the long run, gather customers who trust him and he will eventually establish a customer base that is unshakable. He is less likely to lose them to other competitors purely on price. We are often willing to pay a premium for someone whom we trust and know will not cheat us. We will also be more than happy to recommend them to our friends because by doing so, everyone wins! Introverts often look at extroverts and see their quiet nature as a weakness. However, introverts are often more careful with what they say and as such, are less likely to offend others. They can often relate better to how others feel and are better to provide advice and solutions to others. They think deeply and are often creative problem-solvers. Sure, they may not be the life of the party but they tend to have close friends; they value quality instead of quantity. No one attribute can be clearly classified as a strength or weakness. It depends on the circumstance. Sometimes, being assertive is good and sometimes it just gets us into a lot of trouble. If we learn to see that, we can learn to be at peace with ourselves. We can stop hitting ourselves over the head over our apparent weaknesses if we can see that they can also be our greatest strengths. 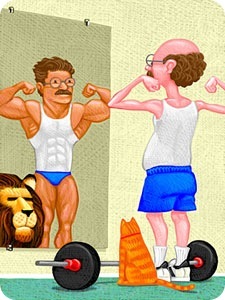 Similarly, we should not be overly proud of our strengths, because they can also be our greatest weaknesses. Thanks for your input and I will use it for my work research that I am doing for this website.